Although the numbers of accounting cases brought by the SEC’s Division of Enforcement have been in decline during the recent past, accounting activity within the Division is continuing at an increasing level. In this webcast, the Chief Accountant of the SEC’s Division of Enforcement joins a panel of experts to analyze the current state of the SEC’s enforcement efforts in the areas of accounting and auditing and where the SEC is focusing its efforts going forward. Our panel will examine recent accounting cases in key areas including improper revenue recognition, cross border matters, impairment and disclosure issues relating to loans and securities, auditor liability and independence, materiality, and internal controls. The panel will also discuss initiatives, priorities and litigation developments within the Enforcement Division’s Office of the Chief Accountant. 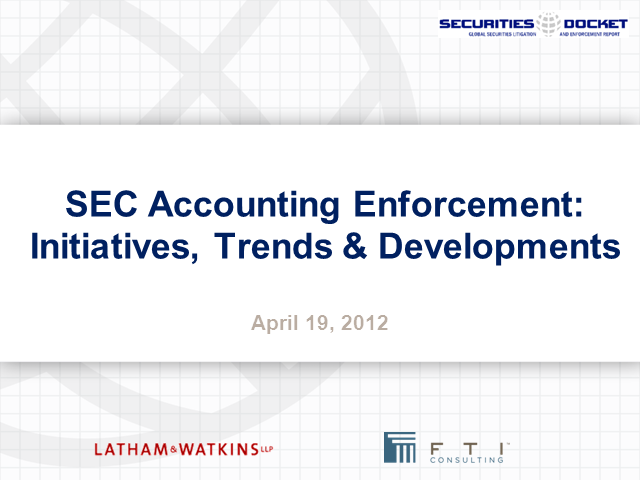 Please join Howard Scheck, Chief Accountant of the Division of Enforcement; William R. Baker III, Partner at Latham & Watkins and former Associate Director of Enforcement at the SEC; and Lisa Troe, Senior Managing Director at FTI Consulting and a former Regional Chief Enforcement Accountant with the SEC’s Los Angeles Regional Office as they address these issues and your questions in a free webcast.